I was the ebay buyer who bought the machine...So here is the background story for what it is worth. The original Las Vegas-based seller had this machine listed for $399 with a BIN of $599. I saw it late one night a week or so ago and asked the seller if he would accept $500. ONLY AFTER I made the purchase, I researched the machine and discovered this forum post and felt like I was duped. Immediately contacted the seller and indicated that I was thinking I was getting an actual production machine (whether restored or not) and I requested a return (in advanced of receiving the item as I knew I didn't want it, unfortunately he had just shipped it out). A few days later I got an email from ebay stating that the seller had opened a case and it was swiftly closed in his favor, now I could not return the item regardless of the 15 day return policy of the listing. I called ebay to appeal and they told me that because I had not received my item that I had lost the appeal and could not appeal again. Here is were I was freaking out and am a little uncertain....thinking I was stuck with the machine I relisted it in an effort to recoop my loss. I listed it as a BIN first and then had to end it to make it an auction or vice versa. Long story short when I got the previous poster's email about the machine being a mash up, I called ebay back and presented my appeal (I had all the photos of the sellers parts pieces and leftovers but didn't even need to present them) and after ten minutes on hold I was told that ebay made a mistake, I won the appeal and that I would then keep the item after receiving a full PayPal refund. I relisted is again as I really just want to part ways with the whole thing. What is a reasonable price for something like this? I am not appealing to the true collector but it is a neat novelty. I tried to be as clear as possible of its origin in the most recent listing as I want any prospective buyer to enjoy what they are knowingly buying. I see the fancy ebay listing for the 4 reel Bar Boy conversion of a turf machine that seems to be seold by a reputable outfit that makes no mention to how recent of a conversion it is...clearly the same paint and graphics. Most of this topic regarding bogus trade stimulators are directed at one person. The "bentcoin" AKA the Vegas Chop Shop. What I don't understand is that he is a member in good standing with C.O.C.A. He is in clear violation of the clubs goals. Year after year they take his dues. Do the officers of COCA read posts on this forum? They must at least look at his auctions of eBay. Bring together and promote fellowship among members. Educate members through meetings, publications and the internet. Cooperate with those seeking information concerning these machines, their history, collection and preservation. Promote fair, ethical practices, dealing and sales within the club and hobby. way it should be, and he was OK with that, but as time went on, I never heard from him, and I didn't have his number. was funny. That was the last day I ever spoke to him, and told him at that time, to "NOT order any strips & cards from me again". one-of-very-few, that came out on the winning end. The following, in RED,is my version of what the Butcher interprets from the bylaws. Oh, like screwing them over, every chance I get! I can't educate anyone on something I know very little about! I will do everything but, as I don't know one machine from the other! WHAT? I don't know what this means! As stated above: When he says he "doesn't know one machine from the other". He doesn't. As he is constantly misnaming both machines and parts on eBay. of those items were returned? My guess, NONE. I am mainly referring to Trade Stimulators here, but I have seen mistakes in Slot parts as well. 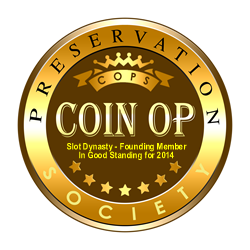 Slot Dynasty: For me it was more a case of ebay courtesy. Obviously my impulse was a factor as if I had done my research sooner than later I would have just passed on it altogether. That said a simple note in the description that this was a modern conversion would have been sufficient to clear the fog, regardless of any of our opinions as to the practice of converting original machines. I tend to think that the far-gone machine may lend itself to a novelty of sorts but the fact that it resembles an actual production machine in title and graphics is the sticky part...if the reels had been your favorite GOP candidates and the whole thing was an election theme...still a traditionalist travesty but an obvious conversion in this great free country that we call home. But back to my first point, all I asked to do was to return the item as per the 15 day return policy on the listing...I was even going to pay the return shipping. I don't think ebay can charge the seller so they chalk it up as a loss (hopefully they can still keep the lights on this month) so I guess this is still a preferred outcome for the seller as opposed to a return. I appreciate the support and information, I joined the forum for some help with a MIlls pocket Vest slot that I was lucky enough to get and I think either the spring is tired or something in the mechanism is sticky as the coin return reset function will slow every so often and not allow the next coin to go in...seems to happen more when in the case then when outside but I have watched it happen outside the case too. But that is for another post. In addition to the Gem Boy I have a Sparky Poker themed trade simulator in my ebay page that also has to go! I can now do a deal on both! cpdretired wrote: Most of this topic regarding bogus trade stimulators are directed at one person. The "bentcoin" AKA the Vegas Chop Shop. What I don't understand is that he is a member in good standing with C.O.C.A. He is in clear violation of the clubs goals. Year after year they take his dues. Do the officers of COCA read posts on this forum? They must at least look at his auctions of eBay. I was contacted a while back from the person whose id is "BentCoin" on eBay. This person is not the Vegas Chop Shop guy. Just wanted to make everyone aware that the eBay seller of BentCoin is not the person being referenced so much in this thread. You're absolutely right. We want to make it clear to all Forum members, that the Jerk we refer to as the "Vegas Butcher", is (thebentcoin) on eBay. of the VCA auction, in which he allowed his kissin-cousin, the Butcher to put all his Crap in the auction, has ceased since Morphy took over the helm. Sidlow was still working with Morphy after the switch, for a couple of venues, but has since been 'let go'. Don't know the details, but he is history. Well, just when I thought that the 'Vegas Butcher' was taking a break from destroying more machines, he is back at it again. this 'piece-of-junk', and spread the word. We don't need this Crap in our hobby. This machine was a perfectly good original when he bought it. With original black wrinkle paint, and cigarette strips & card. that he sells, are Crap as well. Some are even made-up Phoney's, that never existed. This is the eBay entry that I am referring to. Another machine Destroyed by the VEGAS BUTCHER. yep saw that one but, honestly didn't know much about the originals, So thank you for the heads up on the information.